At least some sort of news. First off, I just committed support for xdg-user-dirs to Totem, so your Movies and Music directories will show up in the file choosers (which fixes a bug where Ross tried his hardest not to understand what I was talking about, and used "fab"). Secondly, Tim and Thomas have been hacking on codeina, the interesting part of Codec-Buddy. It allows users to purchase the codecs from Fluendo when they can't play a proprietary format. Hopefully, it will be useful for users that want to support Fluendo/don't know where to get Open Source alternatives/want great Windows Media support. Paying for stuff can look good! Finally, I committed some rough code to watch TV in Totem (xine-lib backend) using DVB cards. It's far from finished, but after creating a ~/.xine/channels.conf using w_scan (the easiest way I've found to create tuner data yet), "totem dvb:" will list all your channels in the playlist, and you're ready to lose some time. Films: one great film, The Machinist (for those who liked Memento), 2 decent ones, Angel-A, and Cars, one I'm ashamed of, but not that much, The Devil Wears Prada, and an utter pile of crap that I stopped before the end (actually, near the beginning), Ultraviolet. Given that relative newbies are likely to face this dialog it seems it should only list codecs which will help them fulfill the current requirement. I guess only the first item would do that, however after being told they need an "MP3 decoder" the "MPEG Playback bundle" doesn't contain any of those words so someone uneducated in this area might be confused. Not a bad idea in principal though. I wonder if it could sell the Free equivalents a bit more. Maybe a bit of text at the bottom saying "A Free equivalent to MP3 is the Ogg format. You may wish to see if the provider of this audio file can give it to you in Ogg format"
Paul: by default it will only list those packages which will help them fulfil the current requirement. In this particular case there should also be an 'MP3 decoder' package (free of charge, like in the web shop), but the list of available plugins the program draws on isn't complete yet for all architectures, that's why it doesn't show in the screenshot (presumably). Excellent. People will start to have opinions about software patents when it's obvious that it means they must pay. Theory is boring. Hopefully, when some other company is also offering codecs, there will be some mechanism for them to be in this same marketplace. As a user, I really don't like the idea of being suggested to buy *non-free* software from within a *free* media player. Please don't include this (or at least turn it off) in the default Gnome distribution! One of the things keeping me from proprietary operating systems is, that they are trying to sell you all sorts of things from within their applications. I really hate that. I don't want my computer to be an advertising rostrum for any companies and their products! anonymous, this isn't just advertising, it's trying to help the users when they need help. Note that Ubuntu Feisty already uses the same mechanism to offer to download non-standard free software codecs where possible, with a warning that they are probably not legal in your jurisdiction. This gives people a choice. This is a very interesting idea that should improve the user experience. However, I would like to see a bit of advocacy in this dialog (next to the light bulb or below the list of codecs). It should mention that software patents are the main reason why some of these codecs are not free , and it should also suggest checking for files encoded in free codecs such as Ogg Vorbis, Ogg Theora or others. For example, the text could look like this: "The media that you are trying to play has been encoded using a proprietary format that may be encumbered by software patents. The patent holders do not allow the decoder to be distributed freely with Totem. You may purchase and install one of the decoders shown in this list, or you may check if the same media is available in formats that are compatible with free software, such as Ogg Vorbis." It could also be interesting to list free (as in beer) decoders of questionable legal status and mention that the user could also install these if they are willing to take the risk. and you have to understand : people does not take the time to read. they have works to do with computers. it's nice, it's good integration ,but it's not the solution to our problem : we have to read any format WITHOUT legals or technicals problems. ho, and totem need dvd video support. murrayc, why not help users some more? For example, when trying to open .docx file let's pop similar dialog, but with offer to buy crossover office + ms office 2007. Or even when clicking on .exe let's offer shiny new windows vista! I'm sure codeweavers and ms would happily provide necessary interface to their online shops. After all they also love helping users when they need help. Sigh. My system plays all of those formats *just fine* with no proprietary codecs. I can understand putting up a dialog when playing a file fails, just in case a distribution fails to install the necessary codecs, but I certainly hope that nobody ships it in a configuration that misleads people into thinking they need to purchase proprietary codecs. In order to play this media, Totem needs to install additional media decoders from the FFMPEG project. Some organizations claim to hold patents over these formats, and thus in jurisdictions which acknowledge software patents, these organizations may attempt to restrict the use of these media decoders, or force you to obtain an additional patent license. You can find more information about this issue at http://www.gnome.org/example/codecs-and-software-patents . Choose "Download and install decoders" to download and install the necessary FFMPEG packages for your distribution. Click "Cancel" if you do not want to download and install the necessary decoders to play this media file. 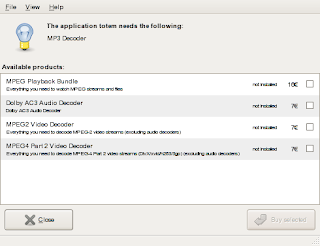 Clicking "Download and install decoders" should get the packages from the distribution if the distribution ships them (for instance, Debian), or compatible packages if the distribution does not. The referenced page can discuss the issue of software patents and media decoders, and point users to the Fluendo codecs *if they need them*. Followup: libgimmie-codec might help here; it provides a framework for distribution-specific codec installation code. Idea of turning totem into Fluendo's adware is quite disturbing. Paying for codecs is stupid. Those from Fluendo have opensouce equivalents in GStreamer plugins packages and in GStreamers ffmpeg backend.